I HAVE MOVED TO SAN RAFAEL! Though I still teach one to two days a week in the Berkeley/Oakland area, as well as at the SF Community Music Center, I am focusing on spending more time in my new digs in San Rafael. Welcome to my voice studio! 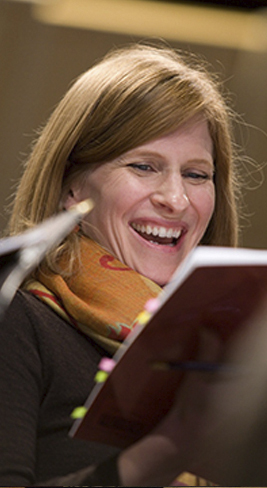 I have taught private voice lessons for over 15 years in the San Francisco Bay Area. My aim is to help my students sing in the most free, natural and expressive manner by teaching them a technique that incorporates optimal breathing, body alignment, and purity of vowel. I feel that these ideas form a strong foundation that can be used in any musical style. I accept students of all experience levels who are 13 years and older (some exceptions for younger students may be made). I also teach interpretation, performance practice, diction, audition preparation and sight-reading depending on the needs of each individual. I have studio recitals biannually which give students the opportunity to perform in a very supportive environment. Lessons are usually one hour in length but 45 minute lessons are also available. My voice studio is in Central San Rafael (near Gerstle Park). I also teach in the Claremont District of Berkeley one day a week. There’s always free parking! Email me at christapfeiffer17@gmail.com or call (510) 410-8453 for rates, location and additional information. "Christa teaches the Randolph method of vocal freedom through attention to the breath and vowel. In the time I have been her student I have increased my range by a fifth and gone from an average on-pitch chorister to someone who gets assigned solos regularly, who sings and enjoys opera, who has served as a section lead, who gets complimented at continuously increasing levels of the person being impressed, and who aspires to become a concert soloist. Her commitment to excellence was key in my achieving these steps. Christa's instruction style is adaptive according to the student, her standards are high, her enthusiasm is great, her encouragement is unflagging and her professionalism (as teacher and as vocalist) is consummate. If you want to take your voice to the next level, you now know where to look." "I highly recommend working with Christa, she is an excellent teacher and an absolute joy to be around! She has been highly influential in helping me grow as a singer and performer. I am very impressed by her versatility and ability to accommodate singers from different musical backgrounds. I came to her after years of singing and performing my own material with no previous instruction. I grew dissatisfied with the quality and range of my singing voice. I wanted to expand my abilities and sing higher, louder, and clearer, but with much less effort and strain. Christa has helped me do just that through her superb skill, instruction, and technique. I am learning to use my voice in a much more powerful, effective, and non-injurious way thanks to her. "It's been a great experience studying with Christa. She helped me learn to sing with new technique that has not only improved the health of my singing, but widened my vocal range. She's great to work with." "THANK YOU!!! I always loved our lessons and learned so much. I feel like I lucked out with the best teacher there is :)! I will always take your vocal guidance with me!"